We decided to return to Lee Metcalf for another summer. This time around, our duties changed a bit and we became the “face of the refuge”, a job we truly enjoyed. 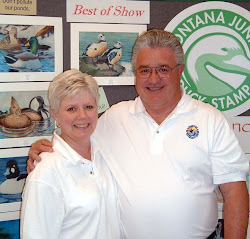 We developed a “traveling road show” and gave evening programs at area campgrounds and the Missoula KOA. We also developed a “behind the signs” program, where twice a week we took people on a tour of the closed portion of the refuge and gave a class on duck identification. We also worked in the visitor center when needed, and I continued some of my woodworking projects. The volunteer coordinator and staff were once again a joy to work with; however, the new manager was a distinct change from the former manager. She did not include volunteers in any refuge activities, and seemed to think we were a burden rather than an asset. Fortunately, we were able to avoid contact with her and have an enjoyable summer.